Paper doll artist, historic costume consultant, certified leathersmith, artwear designer, art instructor, court room artist and teddy bear creator, too. No wonder Charlotte Whatley describes herself as an entrepreneur. Perhaps “Renaissance Woman” might be an even better description of this multi-talented woman. Since 1980 she has been exploring a wide range of creative enterprises, all with great success. Her skill as an artist is superb and her keen enthusiasm for all her various projects and interests are expressions of her bubbling personality. Charlotte was born in the Appalachia area of western Pennsylvania and presently lives with her husband in rural Southern Iowa. However, her artistry is widespread and is included in collections of Bethnal Greene Toy collection of the V&A Museum in London, Texas Tech University Museum and Denver Art Museum, among others. A caricature of Beatle Ringo Starr, drawn when she was only 15 years old and published in 16 Magazine, started Charlotte’s career. It wasn’t until 1982 that she rediscovered paper dolls and began self publishing the exquisitely rendered, realistic yet stylized celebrity paper dolls for which she is so well known. In addition to her self-published, fine art quality paper dolls, Charlotte’s work has been seen in magazines and at conventions, as well as several commercial paper doll books including her steampunk style Alice in Wonderland for Dover Publications. Charlotte Whatley’s talents have great scope, and her paper dolls are a beautiful expression of her skill and artistry, greatly appreciated by collectors. 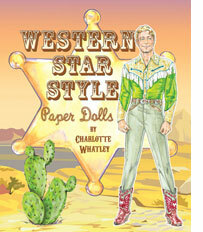 Her current titles for Paper Studio Press include '50s Fads and Fashions, '60s Fashion Revolution, Western Star Style and A Steampunk Tale: Paper Dolls and Storybook.